The Silverlake Jubilee took place on the weekend of May 22 and 23. 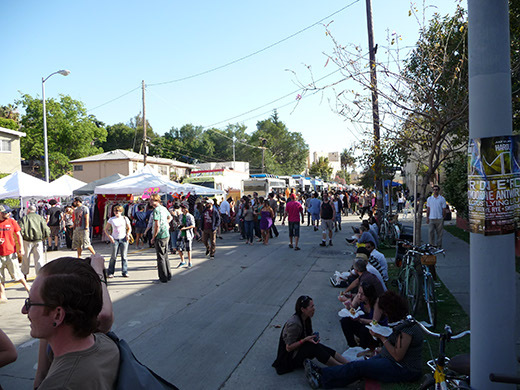 Myra Street was closed down from Sunset Boulevard to Hoover Street, and vendors and people filled the road from 10AM to 10PM on Saturday and Sunday. There was juice you could drink straight from the coconut; serving bowls made out of old vinyl records; more hipsters than you could shake a stick at (I shook one at as many of them as I could manage); and a whole crapload of food trucks. I counted: Derbs (whose truck is tiny! ), the Fatburger Fatmobile, Mrs. Beasley's, Nana Queen's, Barbie's Q, Fishlips Sushi, Uncle Lau's BBQ, Del's, Flying Pig, Louks, Dosa Truck, India Jones, Lomo Arigato, Vesuvio, TastyMeat, Slice Truck, Komodo, Buttermilk Truck, Maui Wowi Hawaiian Coffee and Smoothies, Dim Sum Truck, Frysmith, and Crepe'n Around. 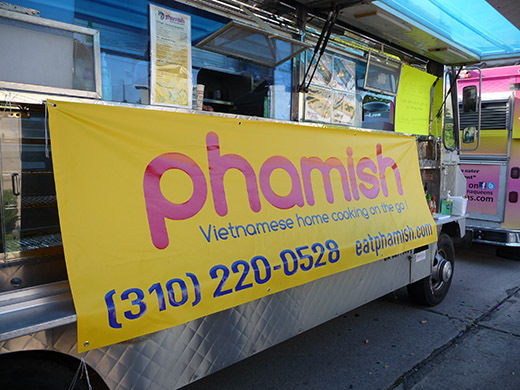 Phamish was there, despite having endured a nasty-sounding situation the previous week in which their truck had been taken hostage: they were using a temporary truck with a banner but no wrap. 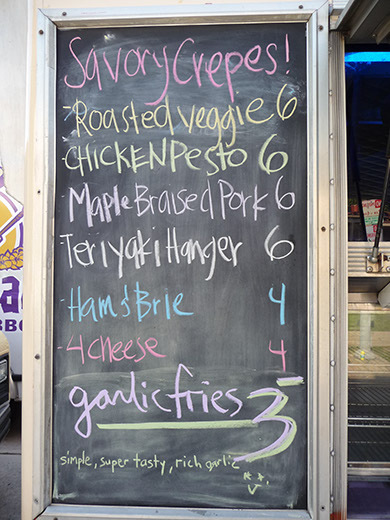 I'd been excited about visiting LA's two crepe trucks, so I was psyched to see Crepe'n Around at the Jubilee. After I set up camp (husband + toddler + stroller + bag + friends who also had all of the above) on the sidewalk next to the truck, I went to place my order. I chose a teriyaki hanger steak crepe ($6). It came in a red-and-white checked paper scoop tray, with the crepe folded over in a cone shape, like a sushi hand roll. Inside: seared hanger steak, pepper jack cheese, mixed greens, pickled onions, wonton crisps, and teriyaki sauce. The meat was juicy, but a little fatty and tough in places. It was coated very evenly with just the right amount of sauce - I was expecting the occasional teriyaki-heavy bite of meat, but none came. The greens and the wontons added a nice crunch. I have to say I didn't even notice the cheese's presence. Perhaps its flavor complemented the other ingredients so perfectly that it simply vanished into the crepe, or maybe the chef forgot to put it on. The crepe itself was the tiniest bit overdone, but I liked it; the very slight crispiness of the browned parts added a bit of nutty flavor. My beef (get it? get it?) with the overall package: a crepe seemed like too delicate a vehicle for such a hearty sandwich. The pieces of steak weren't what I'd call thinly cut, which made the whole package kind of chunky and unwieldy. Also, the teriyaki sauce soon soaked through the crepe. I got three quarters of the way through my meal, and then, as Chinua Achebe might say, things fell apart. Maybe if I'd been eating this dish on a plate with a knife and fork, my experience would have been different, but as hand-held street food, this didn't hold up very well. I think next time I'll try a more traditional savory crepe, like ham and brie. I couldn't resist getting a dessert crepe. 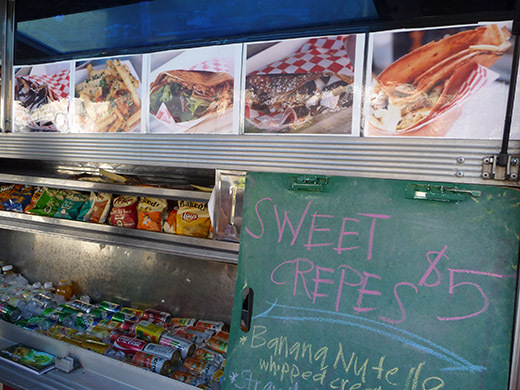 While Nutella looked tempting, I asked the Crepe'n Around crew if they had any lemon juice on board: I just wanted plain old sugar and lemon ($4). They graciously obliged me. This crepe was perfectly done. It could have used a couple fewer squeezes of lemon juice, but it still absolutely hit the spot. I appreciated the Jubilee's zero-waste effort. There was no water being sold in bottles - instead, there were a couple of water filling stations where you could bring your own bottle to replenish your H2O supply. 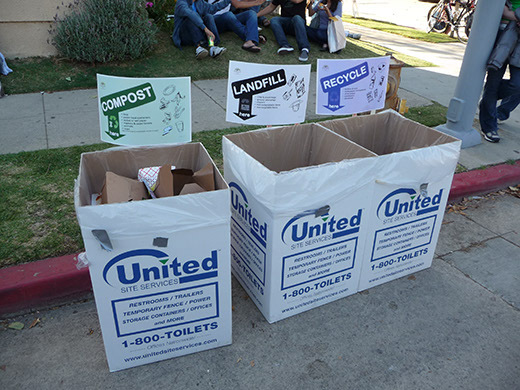 At several points along the block-party route, there were bins in banks of three: one for trash, one for recycling, and one for composting. As ever, though, the occasional dumbass threw the wrong stuff into the wrong bin. I didn't see any event staff sorting the trash into its correct receptacles; I hope they did at some point. I enjoyed the Jubilee. It was like a mini-Sunset Junction. Its acoustics astounded me: unless I stood right by the stage where the bands were playing (which, sadly, I'll have to wait to do until my kid is older and has hardier ears), I could barely hear the music at all. That meant I didn't need to shout myself hoarse or lip-read my friends to have a conversation. Excellent. The only time I was silent was when I was shoving crepes in my face, or inhaling nutella louks from - where else - Louks.